Outplay the homeowner and get a coveted sweet prize! Help the twins outplay the owner of the mysterious house and take all the candy! 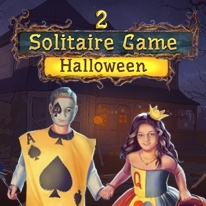 Play classic solitaire with an original game mechanic – match pairs of cards! A special multiplier will increase your reward if you find card pairs fast. Buy bonuses for your reward: mulligan, shuffle and joker. Choose your difficulty level or complete the game twice. Try professional mode if you want a real treat! Scary stories, tricks and treats, and a unique Halloween theme will get you in the spirit!